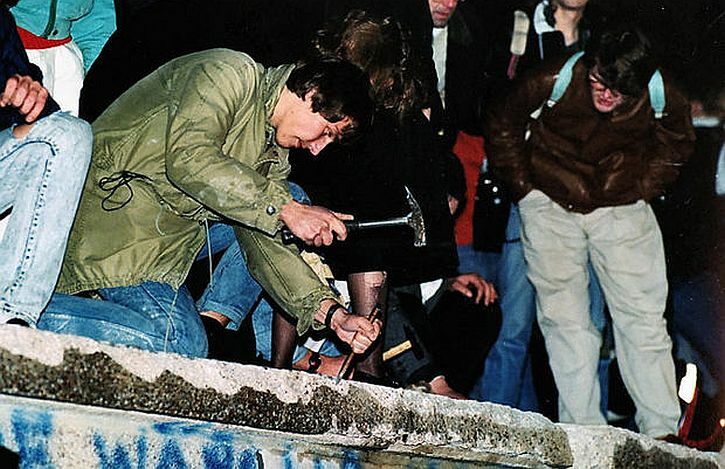 On 9 November 1989, three days before this iconic photograph was taken, the East German government – amid some confusion – announced that anyone wishing to visit the West would be granted a visa. Ecstatic crowds surged at the Berlin Wall and guards were left with no choice but to open the various gates and checkpoints. That night ended forty years of division between East and West Berlin. I was born three months into the Berlin blockade and airlift; on the night of 9 November 1989 I watched as Newsnight broadcast the amazing scenes from Berlin, a five-year old daughter asleep upstairs, dreaming, perhaps, of a brave new world. Nineteen eighty-nine was the biggest year in world history since 1945. In international politics, 1989 changed everything. It led to the end of communism in Europe, of the Soviet Union, the cold war and the short 20th century. It opened the door to German unification, a historically unprecedented European Union stretching from Lisbon to Tallinn, the enlargement of Nato, two decades of American supremacy, globalisation, and the rise of Asia. The one thing it did not change was human nature. In 1989, Europeans proposed a new model of non-violent, velvet revolution, challenging the violent example of 1789, which for two centuries had been what most people thought of as “revolution”. Instead of Jacobins and the guillotine, they offered people power and negotiations at a round table. With Mikhail Gorbachev’s breathtaking renunciation of the use of force (a luminous example of the importance of the individual in history), a nuclear-armed empire that had seemed to many Europeans as enduring and impregnable as the Alps, not least because it possessed those weapons of total annihilation, just softly and suddenly vanished. It wasn’t until June that I realised what was underway. In the Europejski Hotel in Warsaw, we journalists read the inrush of election-result printouts and realised – suddenly – that Polish communism had collapsed. And even then, realising that a non-communist Polish government was about to upset the whole balance of Europe, we did not quite get it. Even then, none of us understood that the whole imperium from the Bug to the Rhine was no more than an old wasps’ nest hanging from a roof – dried-out, abandoned by the stinging hordes, ready to fly to dust at a blow. But the people did get it. They had lost something – not exactly their fear, but their patience. Suddenly it seemed unbearable to go on accepting these systems, these portly little idiots in their blue suits, for another year, and then for another day, another hour. That special sort of impatience is the power-surge of revolution. As they poured into the streets in Leipzig and Prague and Tbilisi and Riga, did they think they might be shot? Yes, possibly. In Georgia and Latvia and Lithuania, many were. But, with their patience, the people in the street had also lost their respect for the men with guns, the portly idiots in uniform. They could kill, but they were no longer real. A future without them had all at once become very real. We know so much more now about how 1989 happened. 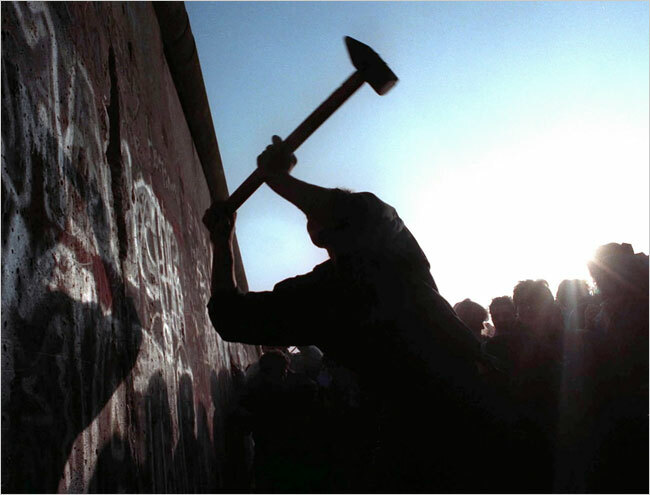 The fall of the wall was consequence, not cause: it was made inevitable by the opening of the Polish Round Table the year before. Above all, by Gorbachev, who went round Europe and the world unlocking the gates and telling everyone that the tanks would not come. Western diplomats and journalists didn’t take him seriously. The party leaderships beyond the Elbe did, and they knew real fear. It was a real revolution. But with one missing feature. That is the feeling in a people that “We have done it once, and if the new lot let us down, we can do it again!” It was that proud, menacing confidence which made the French revolution special. But it’s not around in 21st-century Europe. After 1989, the people handed over liberty to the experts. Will they ever want it back? 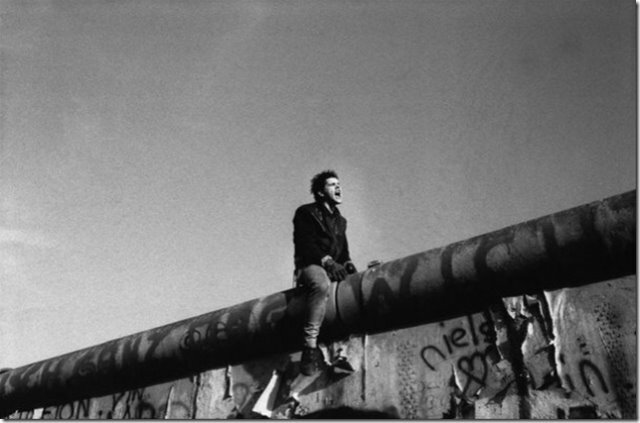 Over 100,000 people attempted to cross the border between East Germany and West Germany or East Berlin and West Berlin between 1949 and 1989. About 1,000 of them died. The first victim at the Berlin Wall was Ida Siekmann who died on 22th August 1961 as a result of injuries caused by jumping out of a window at the Bernauer Strasse, where the Wall divided the street down the middle. The first victim shot at the Berlin Wall was Günter Litfin, who was killed on 24th August 1961. 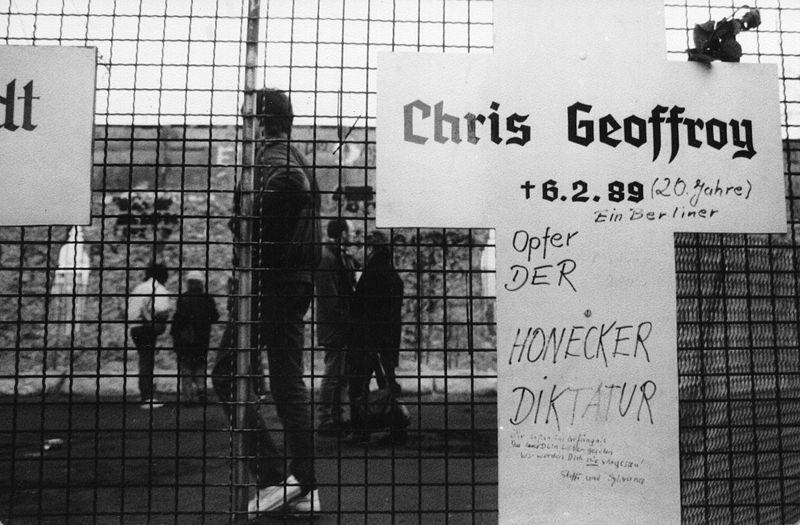 The last victim shot at the Wall was 20 years old Chris Gueffroy, who was killed on 5th February 1989. Probably the most horrifying death was the shooting of Peter Fechter. At midday on 17 August, 1962, he and Helmut Kulbeik, two teenage citizens of the GDR, jumped from a ground floor window on Zimmerstraße, Berlin, into ‘the death strip’ – an area of no-mans land leading up to the Berlin wall. As they reached the wall, ignoring orders from the GDR guards to halt, they were fired upon, with a total of twenty one shots. Helmut made it over the wall to safety but Peter was hit a number of times in the back and abdomen. Seriously wounded, he lay a few yards short of the wall shouting for help. Hundreds of citizens of West Berlin gathered, shouting demands at the GDR guards and American soldiers to help Peter, though they did nothing. Bystanders were prevented at gunpoint from assisting him and it was reported that American soldiers received specific orders to stand firm and do nothing. After fifty minutes of cries for help, Peter fell silent. 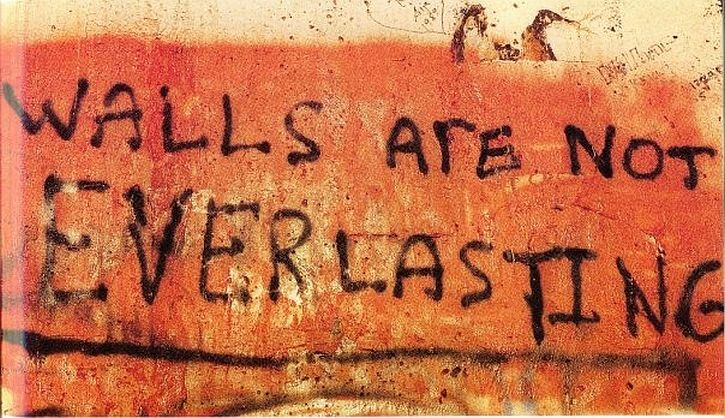 It was events like this that had a powerful effect on my generation; I remember one of the first imaginative essays I wrote in school at the time was about a Berlin Wall escape attempt. His body was eventually removed by East German border guards. In March 1997, two former East German guards faced manslaughter charges for Fechter’s death and were sentenced to 20 month’s imprisonment on probation. I’d always compared him to a small wild horse who you couldn’t cage in. I had to go to the Stasi again and again, and when I was there they explained to me that the state had acted properly – my son was a criminal. Then one of them said to me, ‘Frau Gueffroy, you saidyourself that your son was like a wild horse. And what do you do to wild horses that can’t be tamed?’ I looked at him and said, ‘You shoot them’. And he nodded. And have the walls gone? Far from it; in 2009 there are walls built, being built or planned in numerous locations around the world, including: Israel’s 436 mile through Jerusalem and the West Bank, the wall that American soldiers built around the Sunni district of Adhamiya in Baghdad, the U.S. – Mexico wall built to prevent entry to United States, walls of earth, rock and sand stretching 1,700 miles between Morocco and Western Sahara, border fortications separating North and South Korea. 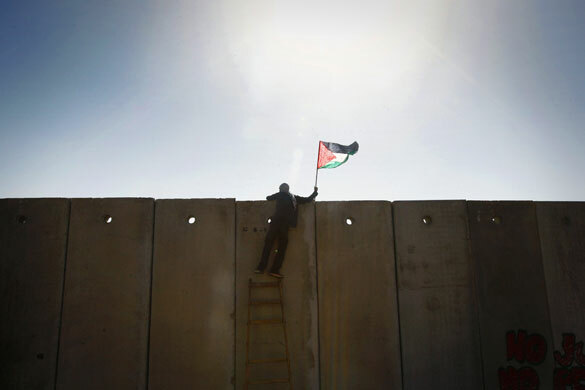 Nilin, West Bank: A demonstrator places a Palestinian flag on the Israeli barrier during a protest marking the 20th anniversary of the fall of the Berlin Wall. 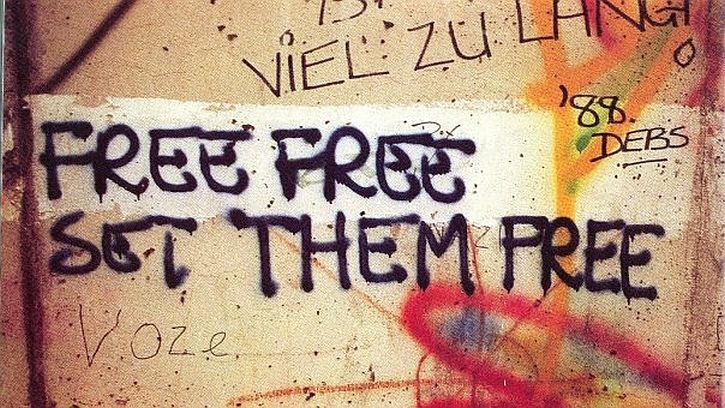 The Berlin Wall – Lessons Learned: 30 minute video covers the history of the Iron Curtain from 1961 to its wall in 1989.